At some point, you have to wonder why people in the Alien universe go anywhere. Sure, the planets they wind up on look nice. (At first.) But inevitably, once you step out your door, you’re going to run into evil corporate executives, genocidal alien scientists, or just the latest in a long series of hyper-adaptive murder machines. Or maybe all three, as these new shots from Ridley Scott’s Alien Covenant suggest. Released by Empire—which is doing a big cover story on the film this month—the pictures show three different versions of bad going to worse. First up, this shot of one of Michael Fassbender’s two robot characters—newcomer Walter, or space-faring severed head David—chatting with their poppa, Guy Pearce’s Peter Weyland. 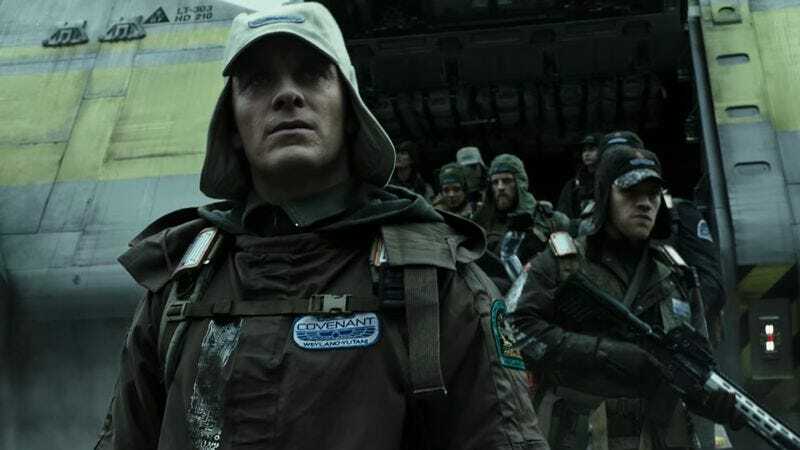 Given that Weyland died—either at the hands of an ominous Engineer, or crushed under his own old-age makeup, we can’t remember which—in Prometheus, this is presumably some sort of flashback or dream. But it’s not like Weyland is going to be giving out good advice, given his obsession with dark science and immortality. Speaking of the angry blue Smurfs, we also get this shot, which apparently takes place over “the Engineer planet.” It’s not clear what’s going on (or who that is standing in the shadows), but it definitely looks like the planet is being seeded with those black urns that caused so much trouble for Noomi Rapace and the rest of the Prometheus crew. So that’s probably not going to end well, either. Better than an encounter with this guy, though. That’s the Neomorph, the newest version of Alien’s ongoing efforts to improve and iterate on H.R. Giger’s original designs. The Neomorph—which appeared briefly in a recent Covenant TV spot—is apparently based on the goblin shark, a real-world creature that’s as terrifying as anything in one of Scott’s movies. So, yeah: Alien: Covenant. Just stay home.